Depression is a common and heterogeneous condition with a chronic and recurrent natural course that is frequently seen in the primary care setting. Primary care providers play a central role in managing depression and concurrent physical comorbidities, and they face challenges in diagnosing and treating the condition. In this two part series, we review the evidence available to help to guide primary care providers and practices to recognize and manage depression. In this first of two reviews, we outline an approach to screening and diagnosing depression in primary care that evaluates current evidence based guidelines and applies the recommendations to clinical practice. The second review presents an evidence based approach to the treatment of depression in primary care, detailing the recommended lifestyle, drug, and psychological interventions at the individual level. It also highlights strategies that are being adopted at an organizational level to manage depression more effectively in primary care. Depression is an important health problem often seen in primary care. More than eight million doctors’ visits each year in the US are for depression, and more than half of these are in the primary care setting.1 Similarly, in the UK, more than a third of all visits with a general practitioner are estimated to involve a mental health component, with 90% of patients receiving treatment and care for their mental health solely in a primary care setting.2 Depression is a broad and heterogeneous condition. In this article, we provide an epidemiologic framework for depression in primary care and review the current evidence on how to most effectively screen for and diagnose major depressive disorder in the primary care setting, acknowledging that efforts to identify and treat depression are limited without adequate support systems in place. To collect and review the evidence available on depression in primary care, we searched the PubMed and Cochrane databases for relevant articles published between 1 January 2007 and 30 September 2017 by using medical subject headings (MeSH) terms including “depressive disorder”, “depression”, and “major depressive disorder” in combination with “primary care” and “general practice”. We did individualized searches for specific interventions thought relevant through the review process, including the addition of “screening” and “diagnosis” in combination with the search terms noted above. We limited our search to the English language. We reviewed titles and abstracts, excluding publications not relevant to primary care or for which major depressive disorder was not the main focus of the study. We then used a pragmatic prioritizing framework to determine which studies to include in the review. This incorporated the level of evidence, with systematic reviews and meta-analyses given priority and interventional studies prioritized over observational studies; the recency, with more recent studies prioritized over older studies; and the sample size, with larger studies prioritized over those with smaller sample sizes. Where competing priorities existed—for example, a more recent smaller interventional study with similar objectives to a larger but older randomized controlled trial (RCT)—we assigned priority by consensus between the authors on the basis of methodology, study population, aims of the study, and outcome measures. In addition, we searched references of included studies for further relevant studies. If a study had been conducted before our search timeframe of the past 10 years, we considered it for inclusion by virtue of its size or methodology or owing to absence of other research conducted in the area. We made reference to older, but noteworthy, validation studies as appropriate. Depression is associated with a combination of genetic, environmental, biological, cultural, and psychological factors. Meta-analysis from six high quality family studies estimates the heritability of depression to be around 37% (95% confidence interval 31% to 42%).7 This is much lower than for other mental disorders,8 suggesting that most depression at a population level can be explained by environmental factors. The challenges associated with correctly recognizing depression in primary care have been widely documented and represent a combination of patient, provider, and system related barriers. Importantly, the likelihood of depression being diagnosed correctly is reduced when patients present with somatic complaints.2526 Although some patients with depression may present with the classic symptoms of depressed mood, many patients will report nonspecific symptoms or only somatic complaints in primary care settings. These frequently include changes in appetite, lack of energy, sleep disturbance, general aches and pains, back problems, severe headaches, menstrual symptoms, digestive problems, abdominal pain, and sexual dysfunction. Older patients are less likely to report low mood and often present with only physical complaints or a deterioration in cognitive ability.27 Similarly, some ethnic minorities are more likely to present with nonspecific somatic symptoms.2829 If they mention it at all, patients will often wait until the end of the primary care consultation to share any concerns about depressed mood.30 Thus, primary care providers must consider depression in patients on the basis of a composite profile of common somatic complaints and depressed mood, as well as the presence of any known risk factors for depression,31 which are summarized in box 1. Recognizing depression in the primary care setting, particularly in patients with multiple comorbidities, can be difficult. Thus, screening with self reported questionnaires has emerged as an approach to aid primary care providers in identifying patients who may have depression but who do not yet have a diagnosis. Clinical practice guidelines on screening for depression in primary care differ between countries, and general consensus has not been reached. This can present a challenge for primary care providers as they implement screening practices. For primary care practices that wish to screen for depression, there is little evidence available on the optimal timing for screening, nor on the optimum screening interval. We recommend following the guidance of the USPSTF,37 which promotes a pragmatic approach in the absence of data, including screening all adults who have not been screened previously and using clinical judgment in consideration of risk factors, comorbid conditions, and life events to determine whether additional screening of patients at high risk is warranted. Primary care providers thus face the challenge of identifying the optimal screening approach for their practice. Many have chosen to adopt a two step screening process, first screening with the PHQ-2 and then confirming with the PHQ-9. A 2011 prospective cohort study of 1024 participants evaluated the two step screening recommendation from the American Heart Association for identifying depression in patients with cardiovascular disease to assess the accuracy and prognostic value. Findings showed that this screening method had high specificity (91%, 89% to 93%) but low sensitivity (52%, 46% to 59%) for diagnosing depression. Participants who screened positive on the stepped depression protocol had a 55% greater risk of events than did those who screened negative (age adjusted hazard ratio 1.55, 1.21 to 1.97; P<0.001).52 Results from a more recent study of 562 patients with heart failure who were assessed for depression by using the two step method, however, showed no clear advantages of a stepped method compared with the two item screen alone or the nine item screen alone for predicting adverse prognostic effects of depressive symptoms.53 Given the limited and conflicting evidence on the effectiveness of this stepped approach, additional research is needed to guide clinical practice. The utility of adding of a “help” question to screening tools has also been explored. A cross sectional validation study of 1025 patients showed that adding a single question about desire for treatment (for example, “Is this something with which you would like help?”) resulted in similar sensitivities but improved both the diagnostic specificity and patient centeredness of depression screening.54 The authors had previously found about five false positive responses for every true positive response for a two item screening test55; however, in this study, the ratio changed from 4.3 to 1.5 when patients responded to either screening question plus the help question. A cohort study of 937 patients in a primary care setting in Switzerland has challenged these findings. The sensitivity and specificity of the two question method alone were 91.3% (81.4% to 96.4%) and 65.0% (61.2% to 68.6%), respectively. Adding the “help” question improved the specificity to 88.2% (85.4% to 90.5%) but decreased the sensitivity to 59.4% (47.0% to 70.9%).56 Although additional studies are needed to further understand the potential benefits of a “help” question as a screening approach, there is likely value in using it to enable ongoing discussions and treatment planning in the primary care setting. With this in mind, it is important to underscore that screening instruments should be used only to enhance, not replace, the clinical interview. Likewise, they should not be used in isolation for diagnostic purposes. The primary care provider should obtain a complete history of current illness, previous medical history, family history, current drug treatment, and any psychosocial stressors and do a focused physical examination. A positive screen for depressive symptoms should trigger an additional diagnostic assessment. Two classification systems are widely used—the Diagnostic and Statistical Manual of Mental Disorder, 5th edition (DSM-5), developed by the American Psychiatric Association, and the International Statistical Classification of Diseases and Related Health Problems, 11th revision (ICD-11), developed and recently updated by WHO. To date, no research has compared the effectiveness of DSM-5 and ICD-11 in diagnosing depression. However, the coexistence of DSM-IV and ICD-10 more generally has been much discussed,5758 and one isolated study focused on the differences between the two systems specifically in diagnosing depression. A 2010 study using item response theory to evaluate the DSM-IV and ICD-10 criteria for depressive disorders in 353 people in Japan found slight differences in the severity of depressive disorders between the DSM-IV and ICD-10 diagnostic criteria. ICD-10 was found to be more sensitive to the mild range of the depression spectrum than DSM-IV. Although some variations in severity existed among respondents, most of the respondents diagnosed as having a severe or moderate depressive episode according to the ICD-10 criteria were also diagnosed as having a major depressive episode according to DSM-IV.59 In the absence of overwhelming evidence supporting one classification system over another, we recommend that either may be used for diagnosing depression in the primary care setting. Although this review focuses on major depressive disorder, depression is a broad and heterogeneous condition. DSM-5 draws a distinction between a range of eight depressive conditions including disruptive mood dysregulation disorder, major depressive disorder, persistent depressive disorder (dysthymia), premenstrual dysphoric disorder, substance/medication induced depressive disorder, depressive disorder due to another medical condition, other specified depressive disorder, and unspecified depressive disorder. Similarly, the ICD-11 classification of depressive disorders includes single episode depressive disorder, recurrent depressive disorder, dysthymic disorder, mixed depressive and anxiety disorder, premenstrual dysphoric disorder, other specified depressive disorder, and unspecified depressive disorder. The common feature shared by these depressive disorders across both classification systems is the presence of sad or empty mood accompanied by somatic and cognitive changes that affect a person’s ability to function, but they are distinct in their duration, timing, and cause. A formal diagnosis of major depressive disorder using the DSM-5 criteria requires at least one key symptom (low mood, loss of interest and pleasure, or loss of energy) to be present, whereas the ICD-11 criteria require depressed mood or diminished interest in activities to diagnose a depressive episode. In both, symptoms should be present for at least two weeks and each symptom should be present at sufficient severity for most of every day. DSM-5 requires at least five out of nine symptoms for a diagnosis of depression, whereas the updated ICD-11 classification system does not quantify the number of symptoms needed. The severity of a patient’s depression should be primarily assessed on the basis of the degree of functional impairment, taking symptom severity into account, rather than being based solely on symptom count. Although this approach makes the grading of severity more subjective, highlighting the distinction is important as evidence based treatment is guided by severity. Both systems classify depressive episodes as mild, moderate, or severe on the basis of the number, type, and severity of symptoms present and degree of functional impairment. Figure 1 summarizes the two classification systems. Depressive symptoms that do not meet criteria for major depressive disorder in DSM-5 or a single episode or recurrent depressive disorder in ICD-11 may be from other depressive disorders. The classification criteria should be consulted directly for a full description of each depressive disorder to assist the primary care provider in making a distinction and, thus, an accurate diagnosis. Any patient who presents with symptoms of depression should also be evaluated for possible bipolar disorder. Patients with bipolar disorder are often misdiagnosed as having major depressive disorder, particularly at initial presentation in the primary care setting, as several studies have found that more than a third of these patients remain misdiagnosed for up to 10 years.6061 Although patients with bipolar disorder are more likely to present with low mood rather than mania or hypomania, it is important to elicit any history of abnormally elevated or irritable mood, with persistent increased energy and a noticeable change from baseline behavior (DSM-5). A 2013 systematic review of seven cross sectional studies measuring prevalence of bipolar disorder in primary care patients with depression or other psychiatric complaints found, through structured interviews, that bipolar disorder likely occurs in 3.4-9.0% of primary care patients with depression, exposure to trauma, medically unexplained symptoms, or a psychiatric complaint. Interestingly, by comparison, 20.9-30.8% of patients had positive results in studies that used screening measures,62 suggesting a high false positive screening rate and limited role for screening for bipolar disorder in the primary care setting. However, as the misdiagnosis of bipolar disorder as major depressive disorder can lead to inappropriate treatment with antidepressants instead of a mood stabilizer, which may induce mania or rapid cycling,63 future research is needed on how to diagnose bipolar disorder accurately in primary care patients presenting with depressive symptoms. Identifying patients with comorbid anxiety can be challenging for primary care providers, particularly as patients often present with somatic complaints rather than classic psychiatric symptoms. Although a review of the evidence supporting the diagnosis and treatment of anxiety is beyond the scope of this series, we recommend using a screening instrument such as the Generalized Anxiety Disorder (GAD) scale, which has been validated for use in the primary care setting for patients presenting with anxiety or anxiety related symptoms. Findings suggest that the GAD-2, as well as the GAD-7, has an excellent negative predictive value, although only one half of patients with a positive screen actually have generalized anxiety disorder or panic disorder.70 The primary care provider must therefore follow up with a more in-depth diagnostic interview to confirm any diagnosis. Is the presentation of the psychiatric symptom atypical? Is the medical condition or substance use temporally related to the psychiatric symptom? Are the psychiatric symptoms better explained by a primary psychiatric disorder? Is the psychiatric presentation a direct consequence of a medical illness or substance use? Although the aim of this review is not to fully explore the differential diagnosis of all possible physical diagnoses, a few of those commonly encountered in the primary care setting are noted here. Neurological disorders such as Parkinson’s disease, multiple sclerosis, and dementia, in particular, often have symptoms that overlap with those of major depression.78 Patients with cognitive impairment may present with low mood, and those with major depressive disorder may have poor concentration with impaired executive functioning,79 making the clinical picture complex. Further assessment with a neurological examination and cognitive testing should be guided by clinical suspicion. Several of the somatic symptoms of depression, such as fatigue or weight loss, also have the potential to be confused with common medical conditions seen in the primary care setting, such as thyroid disorder or anemia. The clinical interview and physical examination should guide any further diagnostic investigation, including laboratory or other diagnostic studies. Once the diagnosis of depression has been made, primary care providers should assess patients for risk of suicide. Depression is a major risk factor for both attempted and completed suicide,80 and a history of self harm attempts, in combination with a history of well developed suicide plans, place the patient at a greater eventual risk of completing a suicide attempt.81 Almost half of adults who complete suicide have had contact with primary care services in the month before death82; so primary care providers have a critical role to play in suicide prevention. Primary care providers face many challenges as they respond to the growing health needs and psychosocial complexity of their patients. Increasingly, they play a central role in the screening, diagnosis, and treatment of depression. Depression in primary care thus must be managed like any other chronic disease.89Table 1 shows our recommendations. Systems based interventions must enable primary care practices to both screen and accurately diagnose depression in a setting where effective treatment and appropriate follow-up are available. As a research community, how can we unravel the biological and behavioral heterogeneity of depression to improve the diagnosis and treatment of depression in primary care? What primary prevention interventions are effective in the primary care setting to reduce the incidence of depression? What is the most effective approach to stratifying the risk of suicide in patients who are depressed and present with suicidal ideation in the primary care setting? What can be done as a society to reduce the stigma of depression and improve the perceptions of people with depression within the general population? Contributors: All three authors made substantial contributions to the conception or design of the work and the acquisition, analysis, or interpretation of data for the work and to drafting the work or revising it critically for important intellectual content; had final approval of the version to be published; and agree to be accountable for all aspects of the work in ensuring that questions related to the accuracy or integrity of any part of the work are appropriately investigated and resolved. Centers for Disease Control. Ambulatory Care Use and Physician office: 2014 state and national summary tables. https://www.cdc.gov/nchs/fastats/physician-visits.htm. Central London NHS. (Westminster) CCG. Commissioning for Value: Mental health and dementia pack. 2017. https://www.england.nhs.uk/wp-content/uploads/2017/07/cfv-central-london-westminster-mhidp.pdf.
. Depression and Other Common Mental Disorders: Global Health Estimates.WHO, 2017. National Institute of Mental Health. Major depression. 2017. https://www.nimh.nih.gov/health/statistics/prevalence/major-depression-among-adults.shtml. , eds. Adult Psychiatric Morbidity in England 2007: results of a household survey.NHS Information Centre for Health and Social Care, 2009. National Institute of Mental Health. Depression. 2018. https://www.nimh.nih.gov/health/topics/depression/index.shtml. US Preventive Services Task Force. Final Recommendation Statement. Depression in Adults: Screening. 2013. https://www.uspreventiveservicestaskforce.org/Page/Document/RecommendationStatementFinal/depression-in-adults-screening.
. Adult Depression in Primary Care.Institute for Clinical Systems Improvement, 2013. National Institute for Health and Care Excellence. Depression in adults: treatment and management. Draft for second consultation. 2018. https://www.nice.org.uk/guidance/gid-cgwave0725/documents/short-version-of-draft-guideline.
. Criteria for assessing a classification in psychiatry. In: Maj M, ed. Psychiatric diagnosis and classification.John Wiley and Sons, 2002: 1-24doi:10.1002/047084647X.ch1 .
. 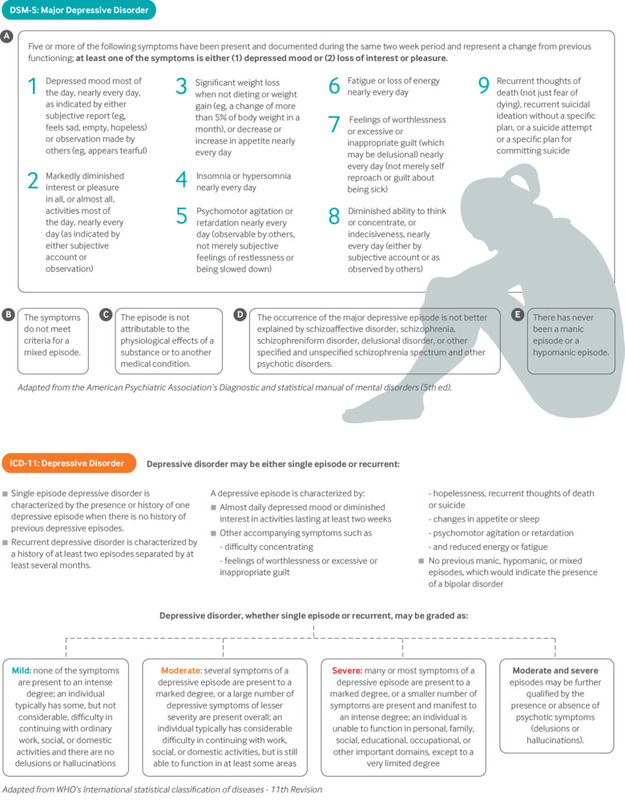 Differential diagnosis of psychotic symptoms: medical mimics. Psychiatr Times2010;27:56-61. The Columbia Lighthouse Project/Center for Suicide Risk Assessment. The Columbia Suicide Severity Rating Scale: Supporting Evidence. 2018. http://cssrs.columbia.edu/wp-content/uploads/CSSRS_Supporting-Evidence_Book_2018-08-13.pdf. Oxford Centre for Evidence-Based Medicine. Levels of evidence. 2009. https://www.cebm.net/2009/06/oxford-centre-evidence-based-medicine-levels-evidence-march-2009/.
. Depression in primary care: part 2—management. BMJ2019;365:l835.